Jama'at e Islami members have broken the long tradition of re-electing their serving chiefs. Jama'at-e-Islami Pakistan is unique as the only political party in the entire South Asia region which is not family-owned or dynastic and holds regular credible elections. In recent elections, the Jam'atis have rejected Munawwar Hasan's candidacy and replaced him with the KP Jama'at chief Siraj ul Haq. Most Jama'at watchers believe Munawwar Hasan is being seen as a serious liability by majority of Jama'at members since he made statements openly endorsing the Taliban war on the Pakistani state, its institutions, and innocent civilians. Munawwar Hasan's pro-Taliban position was a significant departure from Jama'at's stance before he took the reins of his party as its National Amir in 2008. His predecessor Qazi Husain Ahmad famously said in an interview that what the Taliban are doing in Pakistan is "fisad", not Jihad. At another time, Qazi Husain Ahmad said: “The (Afghan) Taliban regime cannot be termed a model Islamic government, as little of what they did was Islamic." The Tehrik-e-Taliban Pakistan (TTP) were so upset by it that they attempted to assassinate Qazi sahib in a suicide bombing. Few Pakistanis know that the Taliban movement was midwifed by Benazir Bhutto with crucial support of Jama'at's ideological rival Maulana Fazl ur Rehman, the leader of Jamiat Ulema Islam which ran many madrassas in the tribal belt along Pakistani border with Afghanistan. Benazir's right-hand man and interior minister Naseerullah Babar was instrumental in building the Taliban during her term in office in 1993-1996. Before Benazir decided to help create the Taliban, the Pakistani establishment (Army and ISI) favored the Afghan Mujahedeen leader Gulbuddin Hekmatyar who was aligned with the Jamat-e-Islami, Maulana Fazl ur Rehman's main rival Islamic political party in Pakistan. 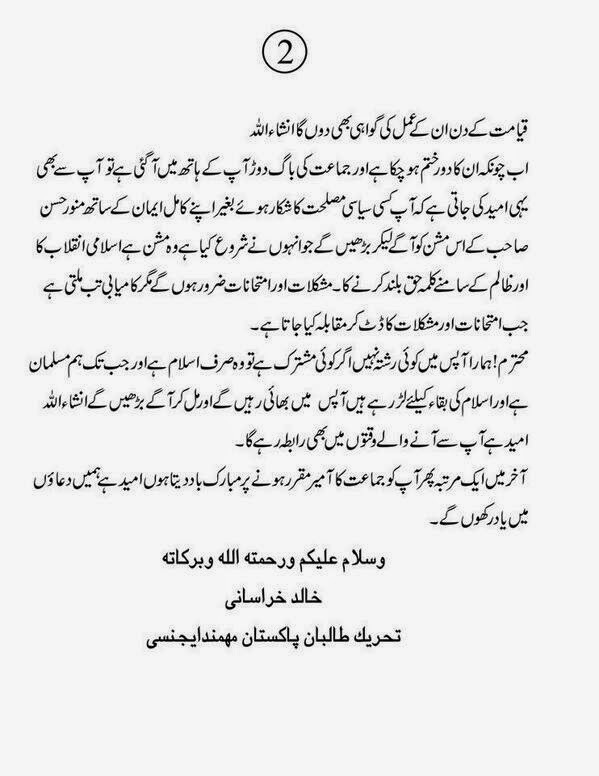 Maulana Maudoodi, the founder of Jamaat-e-Islami was considered a Kafir by many of Maulana Fazl ur Rehman's fellow Deobandis. Both Maulana Fazal and Benazir intensely disliked the Jamat-e-Islami leadership. Jamat-e-Islami had supported late Gen Zia ul Haq who executed Benazir's father and former Prime Minister Zulfikar Ali Bhutto in 1979. Maulana Fazlur Rehman saw this as an opportunity to edge out Jamat-e-Islami by aligning himself with Benazir Bhutto to create and nurture the Taliban who opposed Gulbuddin Hikmetyar. 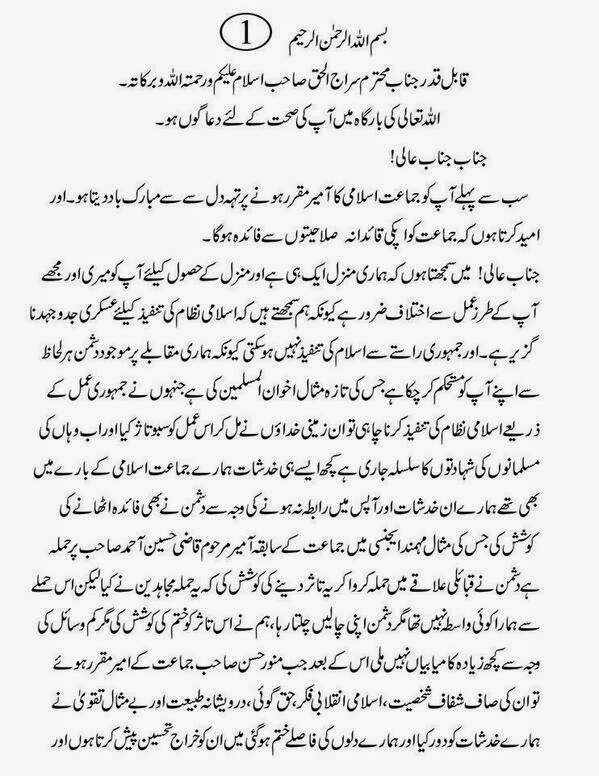 Since the change in the Jama'at leadership was announced, the TTP leadership has written a letter to the new Amir of Jama'at-e-Islami Siraj ul Haq reminding him that "our destination is the same but the difference is in the modus operandi to achieve it.". TTP leader Omar Khalid Khurasani, the man who recently claimed responsibility for brutally beheading 26 Pakistani soldiers in his captivity, has asked the new Jama'at leader to "carry forward the mission of Syed Munawwar Hassan without compromise". It will be interesting to see how Siraj ul Haq responds to TTP's expectations. Is he going to try and appease them? Or take a more uncompromising position as Qazi Husain Ahmed did? What is Nawaz Sharif's Counter-Terrorism Strategy? Can Pakistan Learn From Sri Lanka's War on LTTE? Is Hakimullah Mehsud a Shaheed? Jamat e Islami is the only political party in Pakistan which practices internal democracy. It holds regular elections for its various posts, including its chief. Very interesting. Thank you, Riaz sb. THE Jamaat-i-Islami is Pakistan’s only mainstream political party which practises internal democracy. Sirajul Haq’s election as emir on Sunday after a trilateral contest reaffirms this point in a country where most parties are controlled by political dynasties. This is true of South Asia at large. In India, the Nehru family monopolises the leadership of one of the biggest parties, the Indian National Congress — Rahul is the fifth generation Nehru. In Sri Lanka, the Bandaranaike family has phased out, but in Bangladesh Khaleda Zia and Sheikh Hasina Wajed have for decades headed the parties representing their husband and father respectively. One reason for the JI’s democratic structure is the fact that it is an ideological party. Ghaffar Khan’s party, too, was ideological in Pakistan’s early decades. But barring the election of Ajmal Khattak as its chief, Bacha Khan’s party — its name changing many times — went back to the family fold. As inevitably happens, such parties split not on principles but because of family quarrels. Today Begum Nasim Wali Khan heads her own party but with the same nomenclature. The PPP is in a class by itself. Bilawal Bhutto Zardari is the fourth generation of the Bhuttos to be in politics, and he is now the populist party’s fourth Bhutto to head it after founder-grandfather, grandmother and mother. The split within the party was again not on principles, for it is Murtaza Bhutto’s widow, Ghinwa, who calls her party PPP, with ‘shaheed’ added to differentiate it from the family rivals’ enterprise. Surprisingly, even though feudals do not head the PML-N, its ownership pattern is hardly different from parties in feudal control. It too has become the Sharifs’ monopoly, with scions Maryam and Hamza being groomed for tasks ahead. In Balochistan, with a small middle class, no one should be surprised if the Balochistan National Party-M and Pakhtunkhwa Milli Awami Party have become family enterprises, with sons succeeding fathers. With this perpetuation of family control, and lack of elected hierarchies, most politicians’ commitment to democracy appears hollow.